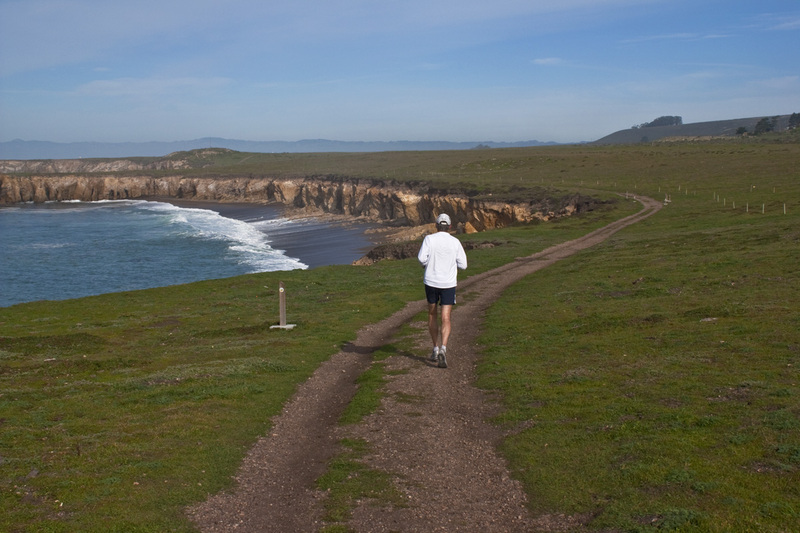 For ten years, I lived just five miles from Montana de Oro State Park along the central coast of California. I was able to run on the trails there two or three times a week. Now I live nearly an hour away, so I don’t get there nearly as often (especially with the price of gas)! But just a couple of days ago I met my son Ethan there for a quick run before he headed off to work. I was grateful to be with him, and to again be in that magnificent place. In addition to being beautiful, I find it humbling as well – in its vastness, it reminds me of my mortality! my body moving with the elements. I am in love with the ocean. It tells me I am small. I take comfort in this truth. In the battered sands of time I disappear. and a new consciousness begins. that I am the one who will pass away. blue and green sphere is transitory. Thanks so much. I mean it to be comforting, because Life is so much larger than any one human being. Our lives are contained within a larger Reality! At age 54 I’m oh-so-aware that I have more time behind me than I do in front of me. With that in mind, I make every moment count. I have you beat by a year, Laurie, so I know what you mean, and I do the same thing – I appreciate each moment! Thanks for visiting my blog.